Hey yall! 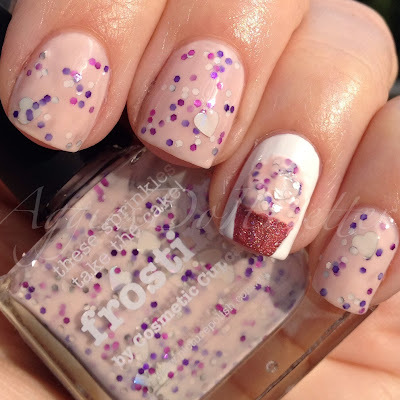 Here's my "sweets" nails for the #nailartJan Instagram challenge. Yall, I was a serious loss for this one! I don't do cutesy stuff on my nails very often, and I went back and forth a million times on what to do. I decided on cupcakes, then realized I could use my bday polish Picture Polish Frosting! I really love how they came out! Here's a pic in direct sun. I'm trying to get more shots in direct sun over shade, I just dislike how my skin tone looks! Hashtag nail polish problems, right. Here's the lineup: the PP is on the sheer side, so I usually use a light pink base to make her last longer. Picture Polish Frosting, OPI Step Right Up! Grammys Nails plus bonus tutorial! Pink deco striped nails plus tutorial! Decorative Stripes Nail Art plus tutorial!